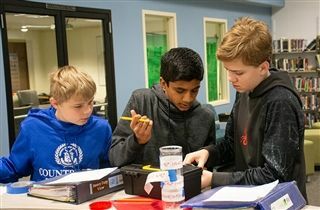 For the past few years, math teachers Sarah Shartzer and Jenni Williams have been using the popular Breakout games in their classes to emphasize collaboration and creative problem-solving. Ms. Williams has been taking her math classes to Breakout games, while Ms. Shartzer has designed her own version of the game, called Fake-out. On March 4, they presented a session for more than a hundred fellow teachers at the Kentucky Center for Mathematics (KCM) conference in Lexington, discussing how they’ve integrated these activities into their math curriculum.